I’ve been leery of the Egerton tall clock punched scroll-board veneer from the git-go. Until this weekend my concerns were in how to attach the veneer – backed by what appears to be speaker cloth – over the scroll-board. If I glue the speaker cloth over the holes drilled into the scroll – holes that are to allow more bell sound to emit as the movement strikes on the hour – I’m sure to get glue on the cloth. That’s not going to work. Also, as I then glue the veneered face to the assembly, once again glue seeps into the cloth and the mess continues. This weekend I found a new concern. How would I finish the clock if I worked out all the attachment issues? There will be no dye or stain, but I will add a layer of boiled linseed oil to highlight the grain in my mahogany. And with shellac as my topcoat, how the hell would I brush, wipe or spray shellac without filling the open weave of the speaker cloth? I’m at a loss and turning to plan B. Or is that E? Not sure. 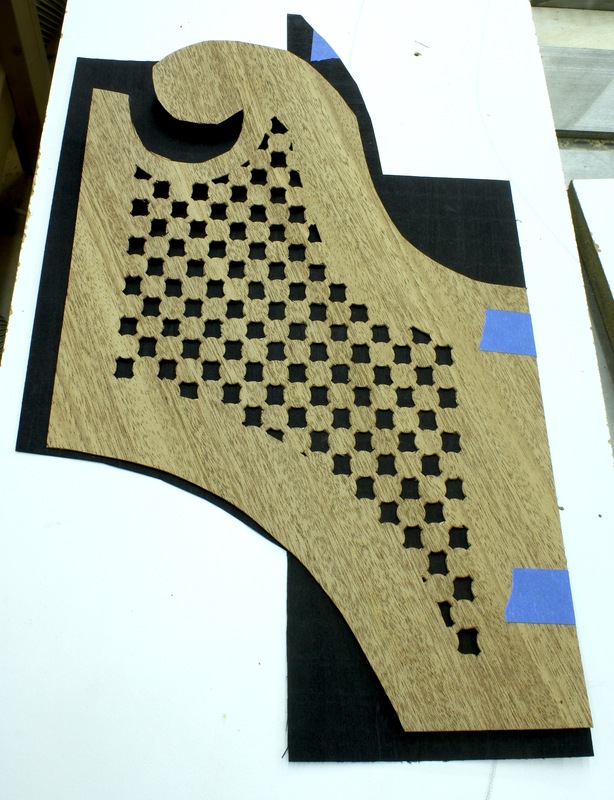 The next plan was to attach my punched veneer directly over the scroll-board without using a cloth between. 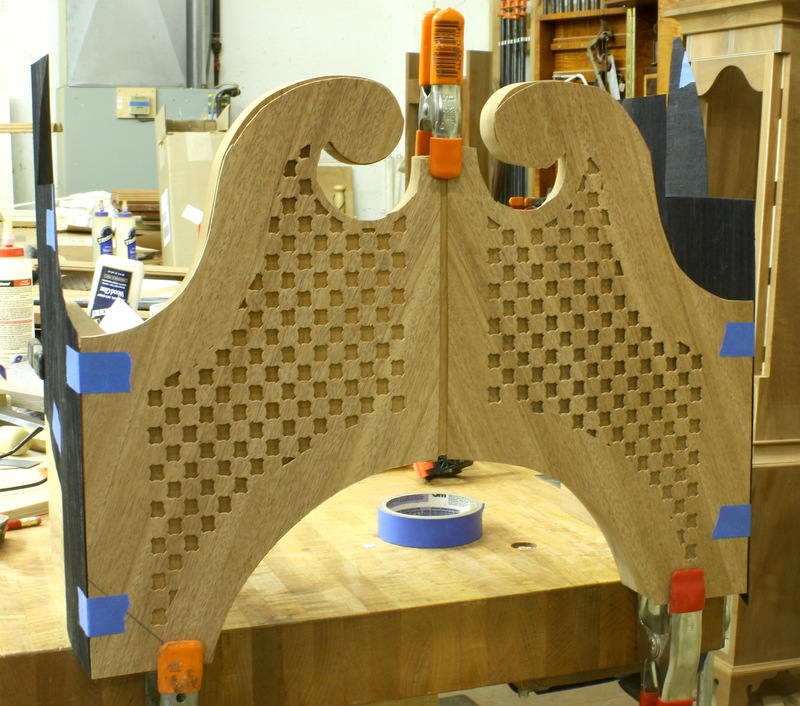 To glue the face veneer to the scroll would be easy, but the holes would be a problem. 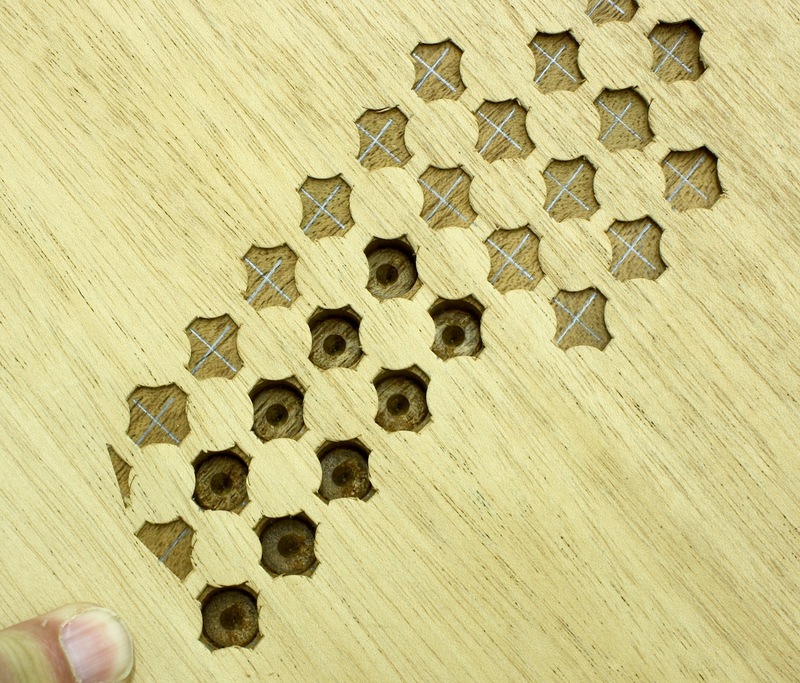 Some of the holes do not go all the way through the scroll and the look in a mocked-up sample was less than stellar. I used a brad-point bit to cut my holes. The center point of the bit left a nasty look in any holes not drilled completely through. Maybe a spoon bit and a brace? Too much work. A round-nose router bit plunged into the scroll? Too much rigging, With another quick look at that arrangement, I knew it was out. Next idea, please. My mind scrambled for an answer. How about black veneer behind the punched-out face veneer? Finishing would be OK. Oil and shellac would work fine on top of the veneer. The look would be similar. Where was the problem? (There had to be one, right.) Sound. That’s it. The idea of the cloth and holes was to elevate the sound of the bell ring. No holes equals less sound. It’s OK to not have holes in the scroll-board. Most clocks don’t and the sound of the chime is still heard. I moved forward. Black-dyed veneer was cut and fit to the punched face veneer. A thin layer of glue was spread and the two veneers were sandwiched between wax paper and two make-shift platens. Clamps held everything flat as I waited to see my results. As the glue dried and I worked on other areas of the clocks, Dave Griessmann, a friend who spends time in my shop on Saturdays – he also forces me to have doughnuts in the morning and lunch at BW3 – suggested that I still place a few holes through the scroll-board to help with the sound. Good idea. I think sound would increase if it only had to pierce two thin layers of veneer. A few well-placed holes are being considered, but that decision can wait until later. Being the visual woodworker that I am, I thumb-tacked the veneer sandwiches to the hood and stood back to take a look. That’s what you see in the opening photo (click on it to make it larger). The contrast is more now than it will be when the mahogany is colored and finished. I like it, but I need some time to decide. You have any ideas?